Report Definition Language (RDL) is a standard proposed by Microsoft for defining reports. RDL is an XML application primarily used with Microsoft SQL Server Reporting Services. RDL is usually written using Visual Studio, although there are also third-party tools; it may also be created or edited by hand in a text editor. SQL Server Reporting Services or other 3rd party reporting frameworks use RDL to define charts, graphs, calculations, text, images (through links) and other report objects and render them in a variety of formats. · Page style – The objects to display including fields, images, graphs, tables. · Field definitions – The extended attributes of fields which are populated with formulas, dynamic data, or Database derived data. · Parameters and Database connections – Parameters that may be furnished by the user or passed in from another application; and database connections and queries for pulling data into the report. RDL is a schema definition, not a programmatic interface or protocol like HTTP or ODBC. RDL does not specify how report definitions are passed between applications or how reports are processed. Also, RDL is meant to be fully encapsulated; meaning that successfully interpreting an RDL document should not require any understanding of the source application. RDL is designed to be output format neutral. This means that reports defined using RDL should be able to be output to a variety of formats including Web and print-ready formats or data-focused formats like XML. It is expected that the in process of generating different output formats, products may represent RDL constructs slightly differently or ignore certain constructs completely. · An XML schema for report definitions. · An interchange format for businesses and third parties. · An extensible and open schema that supports additional namespaces and custom elements. So RDL is XML representation for the definition of a report. This association is classified as XML. The Mime types used with this association are: text/xml. 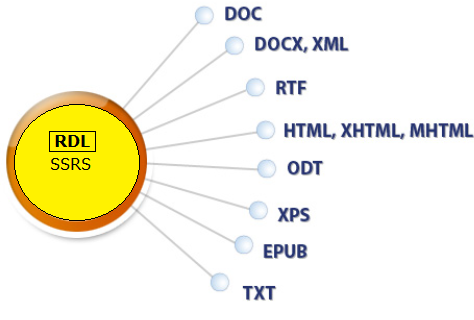 RDL and RDLC are defined by an XML schema called the Report Definition Language. The schema for both file formats is identical. The schema is documented in SQL Server 2005 Books Online. The ReportViewer control, which processes .rdlc files, ignores the <Query> element of RDL. If a report definition contains a query, the control will not process it.